Have you ever seen anything that was pretty as an airport? Of course you haven’t; airports are not known for their aesthetic value. You can put an end to that now with Airport City. Design and construct an airport from the ground up and see if you can turn a profit with it. Manage flights, get travelers in and out of the terminals as efficiently as possible, and keep everybody happy while you do so. You can accomplish that last part by ensuring your customers have easy access to food, entertainment and rest during their time in your corner, especially during layovers. If you can do a good enough job, then you just might single-handedly revolutionize the airline industry. Building an innovative airport is going to be a lot of fun, but you’ll also find that it won’t be without its fair share of hurdles either. Too many things need to be bought, built and done. 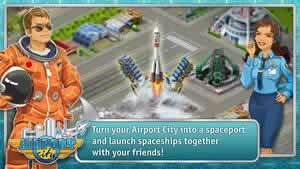 You’ll have to manage your money, time and resources efficiently if you want to accomplish anything meaningful in the world of Airport City. Set up hangars to store your airplanes. Build runways for planes to take off from and land on. Purchase dozens of different airplanes that have varying sizes, speeds, cargo holds, passenger limits and so on. Schedule flights to over 100 destinations, from nearby cities to the Bahamas. Provide power for your airport in a variety of ways. Set up solar panels, build windmills, use nuclear power, and so on. Make your airport look pleasing to the eye. Plant trees, put in lakes and ponds, set up artistic ornaments, and more. Keep the planes coming and going in a timely manner. Get them out of the hangars, fill their tanks up with fuel, get the passengers all loaded in, and prepare for takeoff on the runway. Gain 40 levels over the course of your game. Higher levels unlock better buildings, vehicles and destinations. Believe it or not, the airport is only half the game. The other half comes in making the city around it. However, this won’t be any ordinary city. The city is effectively an extension of your airport. All the services and amenities present are there to make your customers’ stay as pleasant as possible. Build residences so that travelers and commuters can have a place to stay in case of long delays or layovers. Set up restaurants and other business ventures to bring in more revenue for your airport. Entertain customers out of even more money by putting museums, malls, movie theaters, and more into your city. While Airport City gives you a lot of freedom to develop your airport in whatever way that you like, there are plenty of jobs you can undertake to help speed things along. These are often timed affairs that require a lot more focus than usual. If you can pull them off, then you can expect a good bonus in pay alongside other wonderful boons. Find your best pilot’s lost briefcase. Arrange special flights for your VIPs. Increase your employees’ morale by purchasing special items for them as gifts. Build a monument for a heroic pilot. 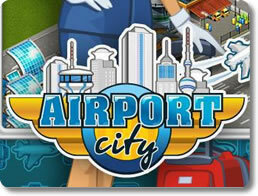 With Airport City, you can play a city-building game that’s not quite like anything else out there. You aren’t just building a city; you’re building an all new airport that will change the way people think of flying forever. There is also a strong element of time management to keep in mind, especially when it comes to completing missions and scheduling flights properly. Whatever the case may be, get out there and start breathing new life into the airline industry once more!